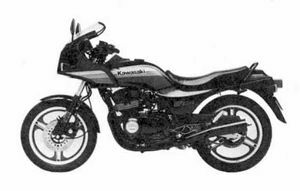 The Kawasaki ZX550A is a motorcycle produced by Kawasaki from 1984 to 1985. 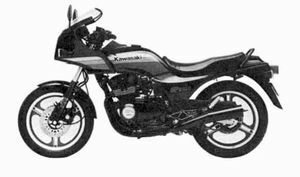 The ZX550A was marketed in the US as the Kawasaki GPz550. 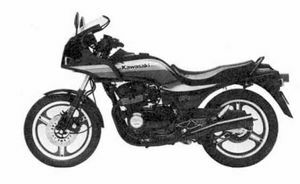 Kawasaki's first GPz550 of 1981 was not only the half-pint brother to the firm's GPz1100 muscle bike, it was also a mould-breaking machine in its own right. 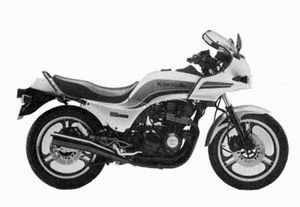 Until then, four-cylinder 550s (which at the time was the preferred middleweight capacity, the vogue for 600s didn't start until 1986) were general-purpose roadsters, with no particular performance emphasis. 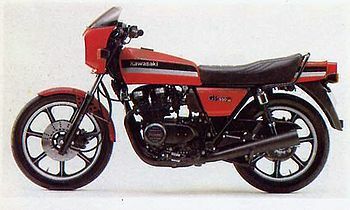 That changed with the mean and moody, black and red GPz. When first revealed, it caused quite a stir 53bhp was quite something from a middleweight in those days. 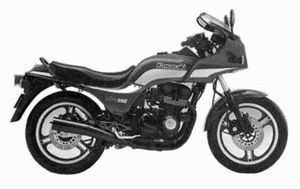 And even thought the little GPz relies on air-adjustable forks and twin-shock rear suspension (an even racier Unitrack version followed in 1983), it's still a nippy urban tool that will happily keep up with the more modern stuff if the right hands. Remarks: Upgraded the Z(KZ)550-H. Fairing, air adjustable front fork with antidive, new spring tension adjustable rear shock absorber, LCD fuel gauge and Warner unit. This page was last edited on 21 January 2011, at 00:04.